Garter stitch border, curved brim with yarn overs, and a large pointy top (12 inches high!) 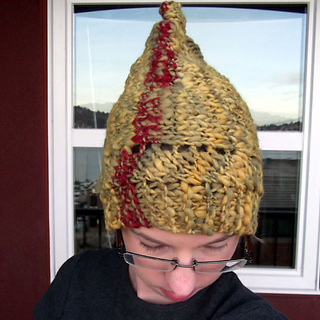 makes for a whimsical and funky hat, slouchy and perfect for thick rustic handspun yarns. The hat knits up in just a couple of hours, making it fast enough for gift giving, but entertaining enough to knit to keep you occupied!